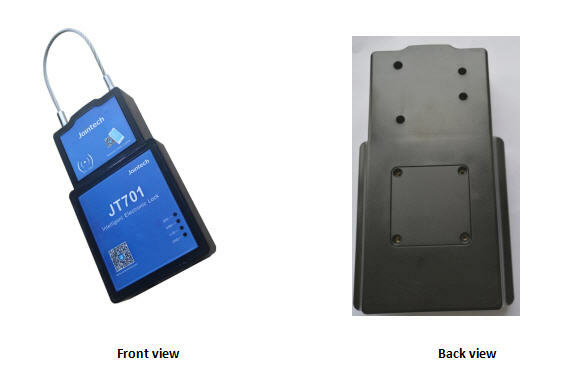 Find Trailer Lock With GPS Tracker, Electronic Seal, Cargo Tracking on Industry Directory, Reliable Manufacturer/Supplier/Factory from China. Model NO. : JT701 Use: Automotive Port Number: Multichannel Screen Size: No Screen Chip: Sirf Certification: ISO14001 Transport Package: Carton / Plywood Box Origin: China Type: GPS Tracker Operating Principle: Mixed Type Model: Integration Type Carrier Frequency: Dual-Frequency Brand: Jointech Trademark: JOINTECH Specification: 195mm x 114mm x 37mm HS Code: 9032899090 JT701 is an intelligent GPS Electronic lock, which combines GPS tracker remote management function and Electronic Lock function. It is used mostly in customs goods supervision, Logistics goods transport, valued asset live monitoring, etc. lasts 7 ~ 30 days in real time monitoring mode. The device will fall asleep if no motion detected for preset time, and be activated as soon as the motion detected. Contact us if you need more details on Trailer Lock with GPS Tracker. We are ready to answer your questions on packaging, logistics, certification or any other aspects about Electronic Seal、Cargo Tracking. If these products fail to match your need, please contact us and we would like to provide relevant information.